It’s a word we all know, think about, deal with and focus on every day. However, there is one part of your life where you are likely ignoring this word, the stock market; and if you continue to, trust me, you will likely not have anything close to the retirement you desire. Compare the average investor’s returns around the world to the average Wall Street firm’s returns. I think we would all agree that the average Wall Street firm is making the lion’s share of the money, while the average investor isn’t coming close to achieving their financial goals. All this in a stock market that rallied substantially. Next, think about what the average investor around the world does in the stock markets; they buy stock. Now, think about what the average Wall Street firm does; they sell stock. Hhmm… One group is selling and making strong returns each year and the other, who is buying, hardly ever achieves their financial goals. Understand that I am not at all suggesting the average investor should stop buying stocks and start selling. What I am strongly suggesting is that the average investor needs to start thinking the markets and investing like Wall Street does. When all these items are true, buy the stock. This is what everyone is conditioned to do in regard to the market. Let me ask you, when all these items are true, where do you think the price of the stock is? It is hardly ever going to be cheap when all the boxes are checked on the list. Most of the time, the stock price will be high. Now let’s consider the basic lesson of how you make money buying and selling anything. The most profitable companies in history have mastered the art of buying at wholesale prices and selling what they bought higher, at retail prices. They simply repeat this process over and over and over. Think about the people you know who are smart shoppers when buying anything. They cut coupons, look for sales and negotiate for lower prices. This is also what our parents try to teach us during our developmental years. The major issue here is that how we are conditioned to buy and sell in every other aspect of life and how people buy and sell in the markets are 100% opposite. Again, when buying and selling anything in life outside of the trading and investing markets, we all try to buy at wholesale prices and sell at retail prices (homes, cars, whatever…). When buying and selling stocks however,, most people buy near retail prices and sell near wholesale prices. The average investor spends their life scratching their head because they can’t make this concept work, while the Wall Street minds laughs all the way to the bank. What happens each day in the stock markets is a massive transfer of accounts from the people who don’t have this basic understanding, into the accounts of those who do. The movement of price in any and all free markets is a function of pure supply and demand. Low risk, high reward and high probability buying and selling opportunity is present at price levels where this simple and straight forward equation is out of balance. 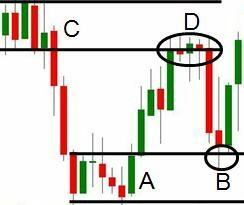 Meaning, price always turns at price levels where supply and demand are out of balance. Learning to identify a supply and demand imbalance on a price chart is the key to knowing where price is going to turn next and, therefore, knowing where and when the next trend is going to begin. Let’s review a price chart to get a basic understanding of how we quantify supply and demand, as this will lead us to our objective opportunities for low risk gains. Notice price level A. For a period of time price was stable, suggesting supply and demand is in balance (equilibrium) at that level. Once price moves higher from A, it is clear that there was no equilibrium at A. In fact, we can now say that price level A represents a major supply and demand imbalance. We know this to be true because the only reason price moves higher from A is because there was much more willing demand than supply at A; it simply took time for this unbalanced equation to play out. You don’t need a technical indicator or some professional to tell you this, its simple logic. B represents the first decline in price to the objective demand level which is where we find our lowest risk / highest reward buying opportunity as we expect price to turn higher from this point. C is just the opposite. It is a price level where objectively, supply exceeds demand. For a period of time, price was stable at level C, and then there was a sharp decline. The decline tells us that there is much more supply than demand at C.
D represents the first time price revisits the objective supply level which is where we want to sell or sell short as we expect price to turn lower at this point. Live Market Timing Session with Sam Seiden: June 25 – 29. Stock market high and low. 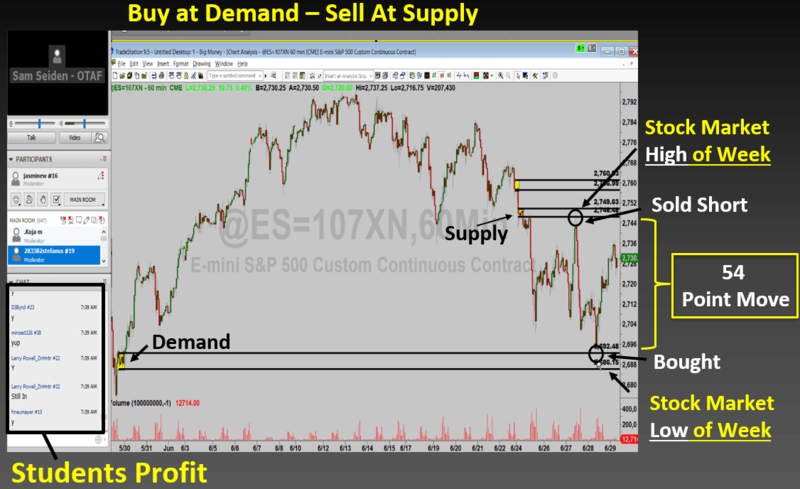 Wall Street (the consistently profitable trader/investor) simply buys at demand (wholesale) levels and sells at supply (retail) levels. For reasons mentioned at the beginning of this piece, the average trader and investor simply doesn’t, often taking the opposite action. This is why Wall Street, or the Wall Street mind, has such an easy time gaining profits and the average investor doesn’t. Now you can understand exactly where those profits come from. The reason the average investor never considers what I am suggesting in this piece is because they are blinded by the strong illusion that how we buy and sell in the trading and investing markets is somehow different from how we properly buy and sell anything. This illusion and misconception is single-handedly responsible for the massive transfer of accounts from those who are blinded by it, into the accounts of those who understand it. Simply put, how you buy and sell things in every other part of your life, grocery shopping, cars, homes and so on, is EXACTLY how you should be buying and selling stocks and any other markets you may trade or invest in. There is NO difference in the proper action. Buy low, sell high and begin to smile at your finances just like Wall Street does. Start Focusing on PRICE and start to enjoy complete clarity and control of time and choices in your life.